This week, EFF once again joins a coalition of national and local transparency and press organizations in celebrating Sunshine Week as a way to bring attention to the importance of public records and the need to remain vigilant despite government push-back. Forty-seven years ago, President Lyndon B. Johnson signed the Freedom of Information Act (FOIA) into law, giving the public the right to access records pertaining to government activities. Pronounced “foy-yah” by those who regularly employ it, the law serves as a sort of citizen subpoena process; if you ask for a record that doesn’t fall under a confidentiality exemption, the government has to produce it. Each day this week, EFF will be sharing details about our efforts to hold the government accountable using this crucial tool, including our successes and challenges. To kick it all off, here’s a breakdown of our greatest transparency hits since the last time Sunshine Week rolled around. In November, EFF proudly launched our new Transparency Project. The portal serves as a resource for the public to learn not only about our work exposing the myriad techniques and technologies the government uses to keep tabs on private citizens, but to make the whole accountability process more accessible to journalists and members of the public alike. Our transparency team has compiled a handy history of FOIA, a guide to leveraging the law for greater government accountability, and a comprehensive database of the documents we’ve collected over the course of our organization’s history. You can browse and search all the documents EFF has received here. Easily our most popular data set in the last year involved drones in domestic airspace, appearing in everything from tech blogs to Sen. Rand Paul’s recent 13-hour filibuster. EFF obtained enough data to compile an almost-comprehensive map of government agencies and universities that have applied for “Certificates of Authorization” (COAs) for drone flights. We say “almost” because even after EFF’s two FOIA lawsuits, the Federal Aviation Administration—the agency charged with regulating drone flights in domestic airspace—has yet to embrace the concept of data consistency. The numbers of domestic drone authorizations disclosed to EFF, the Government Accountability Office, and Congress are incongruent, but you can rest assured that EFF will continue to pursue the facts. 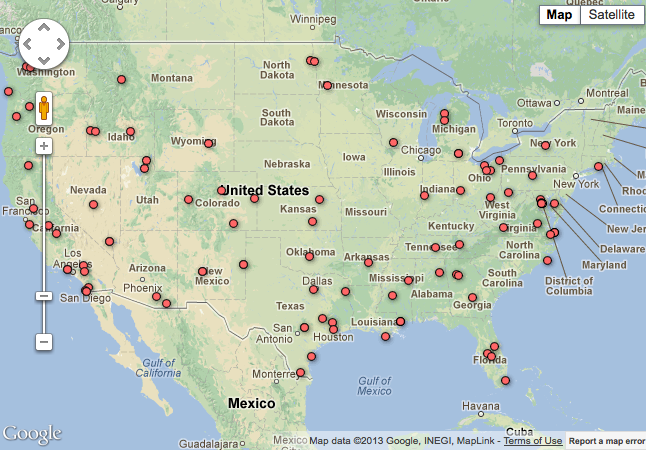 Also, keep an eye out for a new and improved drone map EFF will launch in the very near future. As proud as we are of our work, EFF is even more encouraged by the public’s engagement in holding local government accountable. Through a ground-breaking partnership with MuckRock, an independent journalism organization with backing from the Sunlight Foundation, more than 275 crowd-sourced public-records requests have been filed with local, state, and federal law enforcement agencies and universities to obtain information on how those agencies plan to deploy drones. Dubbed the “Drone Census,” the project makes it easy for citizens to file records-requests and track them. So far, the project has resulted in documents that expose drone programs across the country, from University of Washington to the Miami-Dade Police Department, all of which have made been available online. It’s not just your hard drive that carries your personal data; human DNA contains vast amounts of information, and scientists are discovering new, faster, and more comprehensive ways to analyze DNA every year. One of the more alarming recent developments has been the rise of Rapid DNA Analyzers, machines that can process DNA in less time than it takes to watch a Tyler Perry movie. From documents we received recently from US Citizenship and Immigration Services (USCIS) and DHS’s Science & Technology division, we’ve learned that the two agencies are working with outside venders NetBio, Lockheed Martin and IntegenX and have “earmarked substantial funds” to develop a Rapid DNA analyzer that can verify familial relationships for refugee and asylum applications for as little as $100. In this context, the technology can be invaluable in helping asylum seekers who don’t have access to more formal documentation of their circumstances. However, we found that the government had plans to expand the program’s scope: UCSIS thinks DNA should be included from all immigration applicants and stored in the FBI’s criminal database. “The agency also supports sharing immigrant DNA with ‘local, state, tribal, international, and other federal partners’ including the Department of Defense and Interpol on the off-chance the refugee or asylum seeker could be a criminal or terrorist or could commit a crime or act of terrorism in the future,” we wrote after discovering an official flow chart in one document obtained through FOIA. Sometimes when you file a FOIA request, it isn’t the documents you receive that are interesting, but the documents you discover don’t exist. Such was the case when the EFF sought evidence that the State Department reviewed the Anti-Counterfeiting Trade Agreement for constitutionality. Along with 50 legal scholars, we suspected that something was amiss when the United States’ Deputy Trade Representative signed the agreement, which would have established controversial international standards for enforcing intellectual property rights. All international agreements must be vetted by the State Department before they're signed, but when we filed a FOIA request for the State Department's analysis—called the Circular 175 memorandum—the State Department came back saying they didn’t have one. That fact has become yet another hole in the validity of the agreement. Sometimes the government responds to FOIA requests and produces documents, as the law requires. Sometimes EFF has to file a lawsuit to nudge the government to produce the documents. And, sometimes, even after filing suit, the government still won’t produce records. Last year showed the government is willing to go to great lengths to hide details of its interpretations of federal surveillance law from the public. EFF has three separate lawsuits against the Department of Justice, all for information about how the government has secretly interpreted and used its electronic surveillance authority. So far, the government has refused to release any documents that shed light on their practices, so EFF has asked the courts to step in and force them to. The fight against secret surveillance law may be long and difficult, but—as Sunshine Week recognizes—it’s imperative to stand up for the public’s right to know.